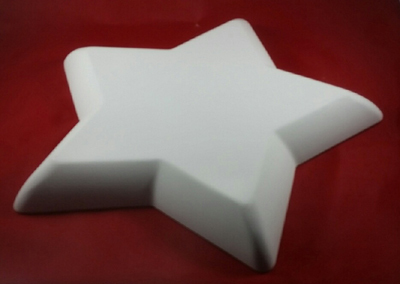 Star shaped plaster drape mold is perfect for easily making pottery serving bowls and platters: chip and dip* bowls, veggies and *dip bowls, cookie platters and more. *For dipping bowls, use any of our smaller round bowls molds (sold separately) and either attache in the center of the star, or use separately. 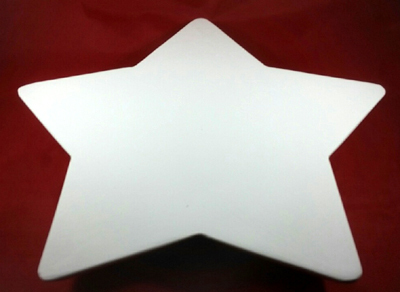 This plaster mold's dimensions are: 11.5" width x 11.5" length x 1" height . All our hump molds are made of pottery plaster and are designed to be used with clay, including earthenware, stoneware, and porcelain. Sizes of molds are in inches; Prices are in US Dollars. Cost of shipping is based on packaged weight. This mold weighs 3 pounds. Sample pottery, when shown, is an example of pottery made with the mold. The price shown is for the plaster mold only. Copyright © 2019, bInfinity Web, Inc. All rights reserved.